Primed and ready, knockout specialist Steven Villalobos is anticipating big things for himself when he steps back into the ring. 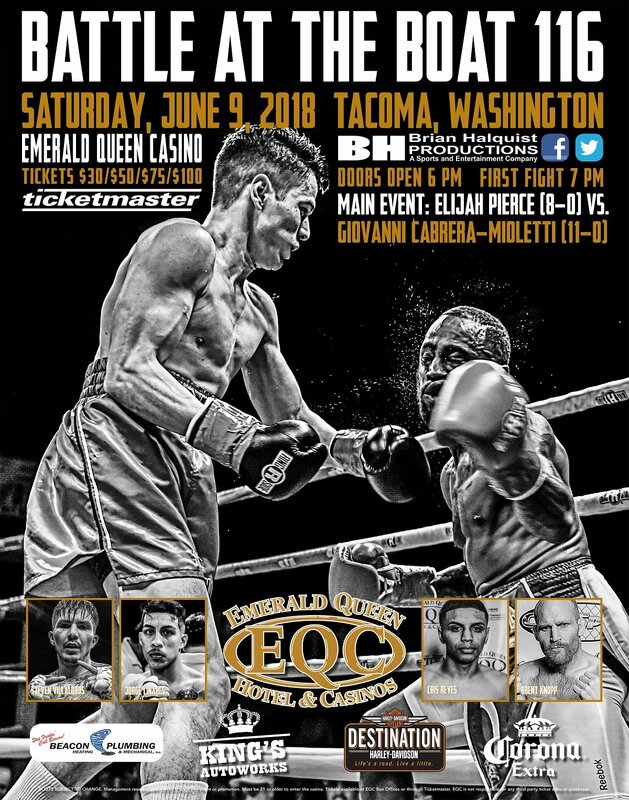 The super welterweight will look to remain undefeated when he faces Jose Leon in a scheduled 5-round semi-main event at Battle at the Boat 116 on Saturday, June 9 at the Emerald Queen Casino in Tacoma, Wash.
Highlighting the six-bout card will be a 10-round main event between undefeated fighters Giovanni Cabrera-Mioletti (11-0-0, 3 KOs) and Elijah Pierce (8-0-0, 7 KOs). Villalobos enters the bout with a stellar 7-0-1 record with six of his victories coming by knockout. His most recent KO came in his last fight on March 25 when he needed just 2 minutes, 48 seconds to hand Luciano Hernandez Garcia his first career setback. It marked the sixth time a Villalobos contest failed to get out of the first round. Villalobos’ lone non-victory came in his Battle at the Boat debut on Nov. 18, 2017 when he fought to a split draw against Eduardo Torres. One judge scored the 5-round bout 49-45 in favor of Villalobos, while another had Torres as the 48-46 winner. The third judge scored the bout a 47-47 draw. Villalobos and Leon (6-2-1, 5 KOs) have somewhat of a history together despite never fighting. The two were scheduled to meet in Idaho on May 24 but the fight was cancelled after a dispute regarding the weight couldn’t be resolved. Residing in Burlington, Wash., Villalobos trains out of the Renton-based Tenochtitlan Boxing Gym. Tenochtitlan Boxing Gym could have a big night on June 9 as Villalobos is one of three of its fighters appearing on the card. The gym will also have Cris Reyes (2-0-0, KO) taking on a debuting Bryce Gonzales and Jorge Linares (3-1-0, 3 KOs) facing Antonio Neal (4-8, 3 KOs). Both bouts are in the 139-pound weight division.